In the Middle Ages monasteries and other libraries tried to obtain copies of various essential texts. Among the most essential were the various books of the Bible, accompanied by a standard commentary, the 'Ordinary Gloss'. A compete set of the glossed books of the Bible usually ran to many volumes, and individual volumes might have only one or a few biblical books each. This copy of the Old Testament books of the prophets Jeremiah and Daniel was owned in the Middle Ages by Worcester Cathedral, according to a later note on a flyleaf. 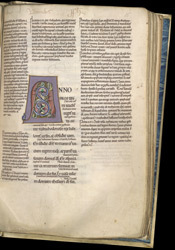 This initial 'A', formed of two lion-like creatures and a dragon-like creature, introduces the start of Daniel. Immediately above it a space for a rubric has been left blank, so a later reader has added a title in the upper margin in brown leadpoint.